How is that the cell maintains internal order, yet it discharges heat (disorder) to the surrounding? If the cell is supplied with materials for metabolism and growth by the surroundings (disorderly environment), then how does that disorder generate order inside the cell? When we zoom out from a single cell to a multi-cellular organism, will the net value of internal order of cells decrease disorder which would contradict the 2nd law of thermodynamics? Note:I would appreciate serious informative answers. The questions are important for me no matter how silly they may look like for you. First question: the answer is actually contained within the question. The cell maintains order precisely by discharging heat. The second law of thermodynamics states that the tendency of a closed system is to proceed from ordered to disordered. Since thermal energy is (to our knowledge) the most disorderly form of energy that exists, in any given system where energy is involved, some energy will always be lost to heat. For instance, if your cell performs the break down of ATP to drive some chemical need of the cell, some of the energy released in the breaking of the bonds in the ATP to form ADP will be lost as heat. This means that the cell's heat is going up on average, and it must export heat to the environment. If the heat was held inside the cell, the cell would rapidly become extremely disordered as proteins de-natured, non-enzymatic reactions sped up, and the cell basically self-destructed. Second question: I think you've slightly missed something. Autotrophs (producer cells, such as plants) are the cells to actually "create order" in the biosystem. 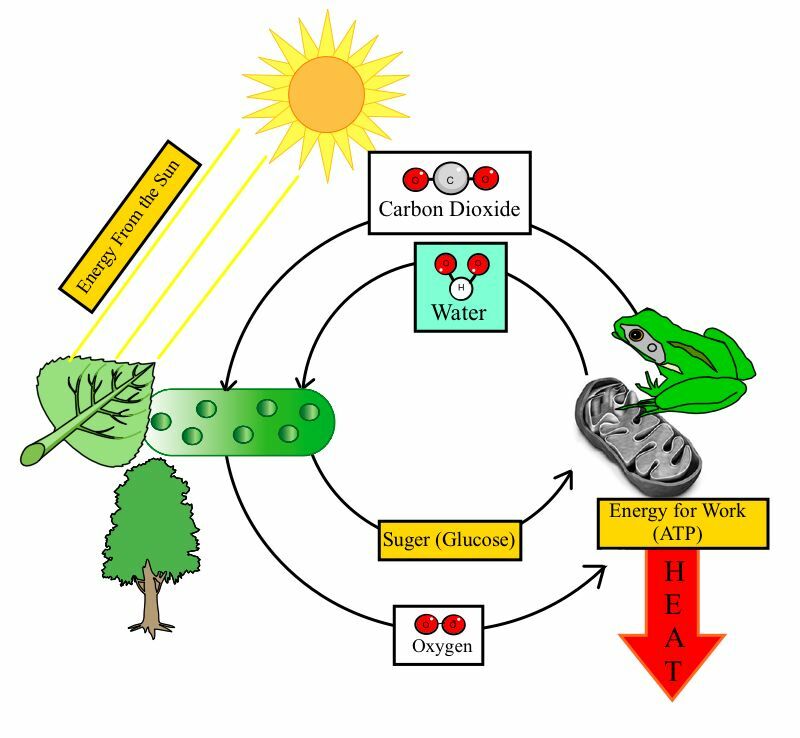 They do this by capturing Carbon dioxide and water from the environment, and using light energy from the sun to bond them together and form complex biomolecules - usually carbohydrates. Third question: Not necessarily. If the multi-cellular organism were a closed system, you are absolutely right. The chemical energy would rapidly be all converted to thermal energy, and the order would disappear entirely. However, bodies are not closed systems: they are continually radiating thermal energy and absorbing chemical energy, either from the sun through photosynthesis, or from autotrophs through ingestion and digestion. Not the answer you're looking for? Browse other questions tagged cell-biology thermodynamics or ask your own question. Doesn't osmosis violate the law of conservation of energy? What is the second phase of photosynthesis?